THriCe is a 3 Oscillators hybrid synth. OSC 1: Waveforms: Saw, Sawx2, Square, Ramp, THriCe OSC. OSC 2: Waveforms: Sine, Saw, Triangle, Square, THriCe OSC. 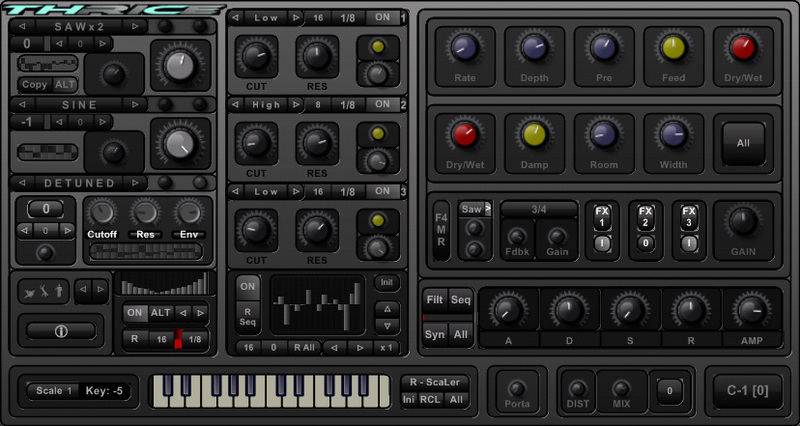 OSC 3: Waveforms: Saw, Sawx2, Square, Ramp, Detuned OSC. THriCe OSCillator is a dedicated FM OSC. Detuned is a Unison OSC. Each OSC has its own individual StepSeq LFO filter modulation. One multiband filter block per OSC plus a moog-like main filter. A main LFO to give more life to patches. Velocity gater with adjustable timing and random sequence creation. Internal sequencer with adjustable sequence length, speed, scale and random feature. Three more random options for patch creation. Filter, Filter Seq or Full synth. A main complete FX section with random features.